Posted on November 17, 2014 by mariskameldrum •	This entry was posted in Daily Life, Hope and tagged Anxiety, bipolar disorder, bipolar moms, bipolar mum, coping with bipolar disorder, craft, Depression, Health, Mania, manic episode, Mental disorder, mosaic. Bookmark the permalink. Great idea. I would like to try mosaic art to get my stress out! Make sure you do – it’s fun and not hard at all once you get the hang of it. Just make sure you cover the tiles with a towel before smashing them to avoid eye injuries! Mariska , this is a beautiful article. I wondered how much feedback you get to encourage you , so I thought i would reply. For me just thrashing some paint around on a canvas helps or listening to a beautiful piece of music. I guess the older I get , just listening to myself and my needs gently and admiring my strength to try again , brings back confidence. Thanks Mel – I always love hearing from other women! I’d love to be able to paint like that…. Sounds like a great outlet. My five year old daughter is very into craft and is happiest with an array of paints, paintbrushes and paper. I find when I’m a bit hypomanic, art is really helpful. I’ve got a house full of quilts, mohair teddy bears, cross-stitches and other sewing projects as a result! The thing I like best is – despite my mental state at the time – my ‘projects’ usually turn out quite well and are something nice to look back at. Ps that mosaic is lovely. Looks like you found your wings again. I also found it so moving that you chose to give it to your mom. As the mother of two little girls who enjoy making crafts and giving some of their creations to me, it would be a dream come true if I ever received anything from them that was along the lines of your hummingbird. I also really enjoyed how you compared the making of the mosaic to your life and specifically mental illness. All in all, the post is so insightful. I really love that idea of brokenness and repair becoming part of the story of who you are – rather than something that you try to hide from others. 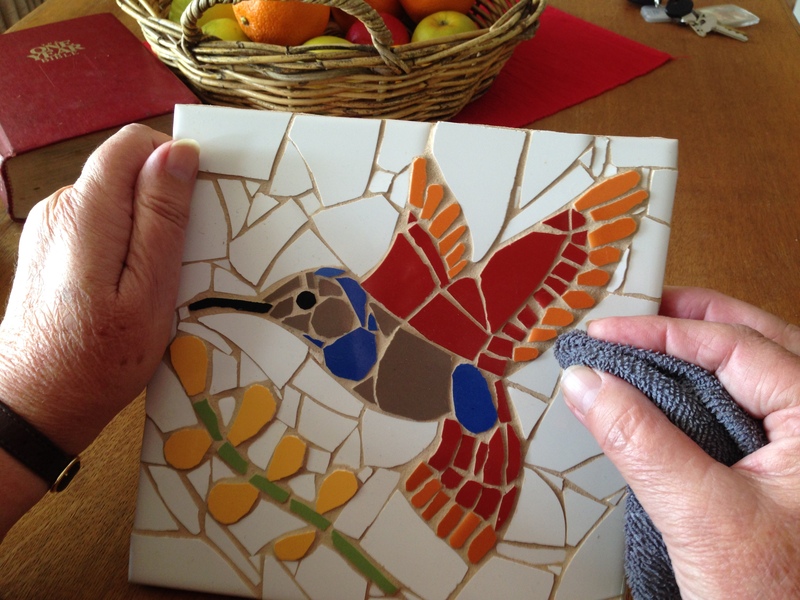 I’ve been on holidays this past week and have been enjoying slowing down and doing another mosaic… I’ll have to share the photos of the finished product tomorrow. Somehow, all that cutting, sorting and gluing of tiles has a really therapeutic effect on the mind – not to mention the fun of chatting to the other women crafting alongside me. Look forward to seeing more of your work. I made one tile mosaic shelf (http://kittomalley.com/2013/10/18/mosaic-tile-shelf/) and hope to eventually make stained glass windows from the materials I purchased from my father-in-law who has made beautiful windows over the years (http://kittomalley.com/2013/10/02/the-window/). I, too, find beauty from making a whole out of broken pieces. Wow! Your mosaic shelf is really beautiful… I love the son rising over the mountains. Sometimes, I find that doing craft is a great outlet – when you can’t seem to find the right words. Yes. Without doubt. Thank you. I love your work. Hello from Flagstaff, Arizona, USA! Thank you for this blog entry. I’m a mosaic artist & elementary school art teacher, and I’m going back to school in the fall (at age 46) to pursue a master’s degree in Clinical Mental Health Counseling. I want to integrate art into counseling because I know there are many people in the world who will benefit from the therapeutic effects of art as you have so perfectly articulated in this blog entry. Lovely hummingbird by the way! Please check out my work at timeforart.blogspot.com or karenknorowski.com. Oh, and I’m on Facebook. Cheers!